And the walls came a tumblin' down! The last few months I've been listening carefully to pastors from Japan share their reflections post 3/11/11. Their learning is profound because their reflections are deep. The 9.0 earthquake which did relatively little damage given the size and scope of the quake and following aftershocks. The tsunami which brought the most devastation, wiping out over 86 entire communities and destroying homes, businesses, churches and families. And finally, the meltdown of the Fukushima nuclear facility. 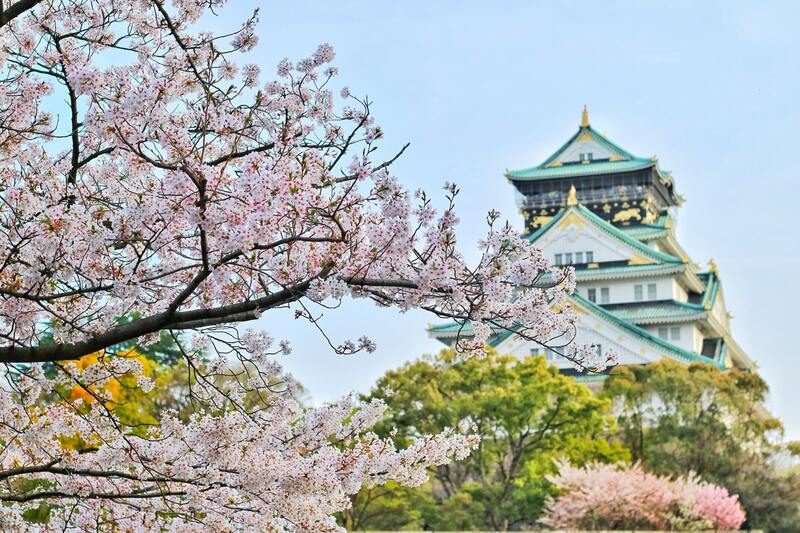 The separation between church and community: Churches across Northeastern Japan have been the center of providing shelter, relief, and supplies. Most notable are the voices of children heard in various regions saying:"Grandma, Jesus is coming… Mr. Christ is holding a BBQ… Jesus brought us food… Jesus brought us clothing!" Prior to this disaster the church was a fairly mysterious entity in the region but now it is known as the place where help is coming from. The walls between churches: Now denominations have banded together to work for the common good of the people and to share the hope that lies within. One church whose attendance has sky-rocketed and seen 10 new baptized believers has people attending who are so touched, that they have pledged to invite 2-3 people each for Christmas celebration. This includes mostly people who have yet to put their full trust in Christ. This same church cannot afford to purchase the land they lease so three different denominations have banded together to raise the funds and purchase the property. Praise God for this Brethren Church and the Evangelical Free and Presbyterian Church of Japan for rallying together to help one another. The common pledge across the denominational spectrum is 'we commit to work together and not build walls between us'. The wall between Japan and the world: The global church has rallied to Japan's side following this horrific disaster and the community and bonds that have been established will continue for many years. Of particular note was the work of the Haitian Church. In the midst of their own pain and loss, they raised about $3,000 to help the people of Japan – one lady even went so far to sell her wedding ring to stand by her sisters and brothers in Japan. What a powerful story of the community of Christ rallying behind one another… Rich and Poor alike, saying we are committed to helping one another through crises. Finally, the point of greatest reflection: the cross of Christ. As one looks at the pain Jesus bore on Calvary, in human terms one cannot imagine something good resulting. Everything we know of the cross is bad: pain, torture, agony and ultimately death. The same can be said of the tragedy that hit Japan. However, there is an unseen story behind both the cross and the triple disaster in Japan. Hope rises from the ashes as Jesus brought life from his death on the cross. Today millions of people have been helped and influenced by the model of Jesus and countless souls will live for eternity because of His great love for us. So too, Japan's triple disaster is now showing signs of hope and life following the horrible affects of the devastation. 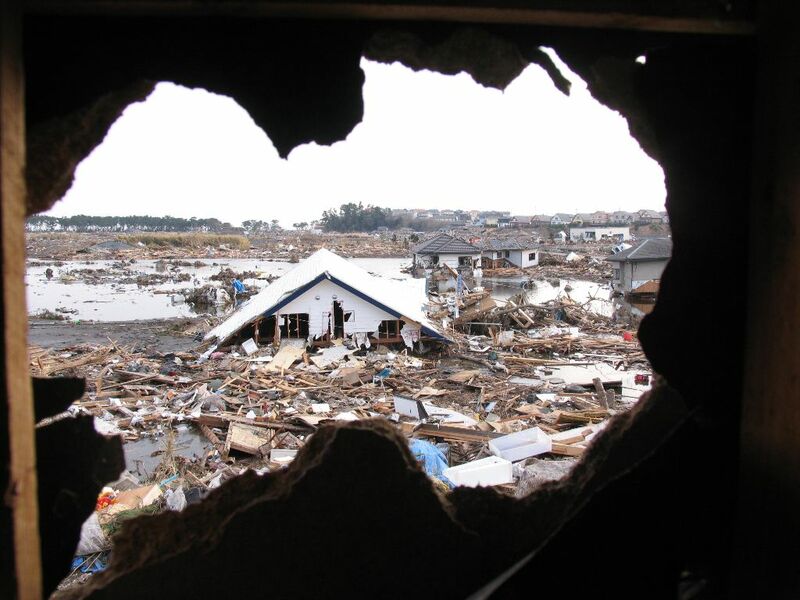 As seen in the stories above, churches across Japan and across the world have rallied to be the church and bring new life from mounds of destruction. Thank you this Thanksgiving season for rallying behind Japan during their hour of greatest need! Please continue to pray! p.s. - The first photo was taken in Miyagi about 2 weeks after the tsunami hit. 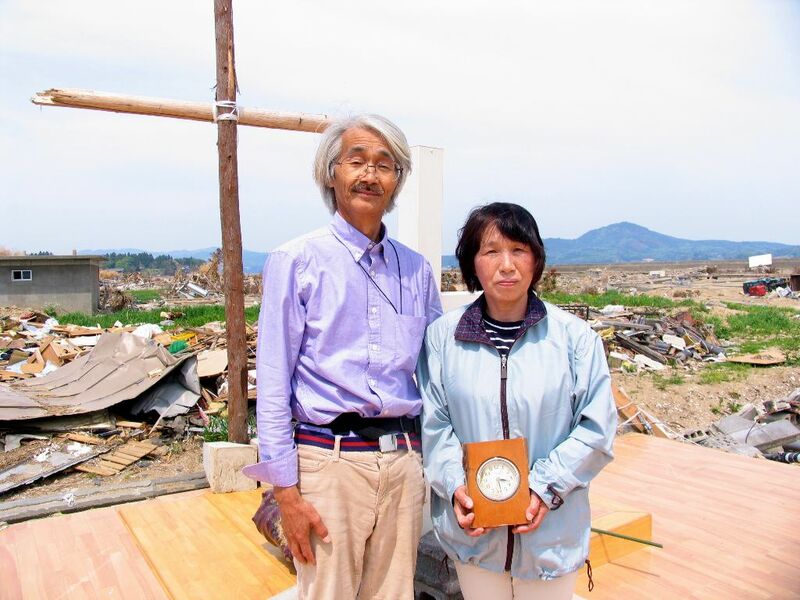 The second photo is of Pastor Minegishi and his wife, who left their church in Kesennuma for higher ground just 18 minutes before the wave destroyed their church and home. But the wave didn't destroy the church's cross or their hope.